As the middle of the 19th century approached, the recently-rural neighborhood around Madison Square saw rapid change. In 1847 the park was opened to the public and within only a few years mansions rose along its borders. In 1856 construction began on the white marble Fifth Avenue Hotel opposite the Park on Fifth Avenue between 23rd and 24th Streets. With the relocation of wealthy Episcopalians northward Trinity Church recognized the need for a “chapel of convenience.” In 1851 Richard Upjohn designed the brownstone Gothic Revival Trinity Chapel on West 25th Street, stretching through the block to 26th Street. In 1866 Jacob Wrey Mould designed the enchanting Parish House to the rear, and in 1870 the chapel school was erected. Abutting the picturesque complex was the handsome brownstone-faced residence at No. 20 West 26th Street. The New York Times would later say of Trinity Chapel, it was “distinctly fashionable to be married there, it was eminently respectable to be buried from there.” Indeed, Trinity Chapel was the scene of the Astor weddings and funerals, the marriages of the Rhinelanders and Gardiners, and the funeral of John Jay. The Italianate-style home at No. 20 reflected the exclusive residential neighborhood. Four stories tall, above a deep English basement, No. 20 West 26th Street featured the extras expected in an upscale residence. The stoop and areaway featured heavy Italianate stone railings and newels, the elliptical arched openings were set within deeply carved frames, and a stone archway supported on foliate brackets hung portiere-like before the double entrance doors. It was home in the early 1880s to wealthy builder and real estate operator William S. Wright. In 1884 he was involved in the development of the Upper East Side, constructing a row of brownstone residences on Madison Avenue near 62nd Street. A year later he had moved out of No. 20 West 26th Street. The house became home to William Seton and his wife, the former Sarah Redwood Parrish. As was customary, the title of the house was in Sarah’s name. Born in Philadelphia in 1844, she was the daughter of Dr. Isaac Parrish. The openings within the rusticated basement level were beautifullly decorated. Before Sarah’s death in the house on Sunday, November 3, 1895, changes had come to West 26th Street. Directly across the street from the Seton home, at No. 19, was the saloon owned by James Helde. Sarah and William were no doubt roused from their sleep on January 18 that year when, as reported in The Evening World the following day, “three men were standing in the middle of the street last night raining broken bricks at the windows and doors of Mr. Helde’s place of business,” Rowdyism of this sort, not to mention a saloon to the rear of Trinity Chapel, would have been unthinkable only a decade earlier. 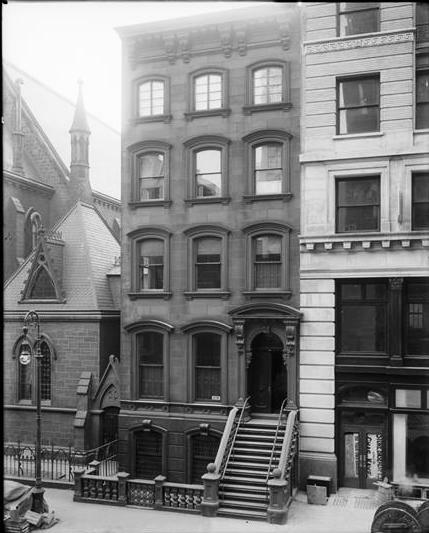 In March 1898 Sarah’s brother, James Cresson Parrish (whose wife, Emma was, incidentally, the daughter of William K. and Emily Vanderbilt) sold the house on West 26th Street. Its last upscale resident would be William Fleischmann. On the evening of February 6, 1909 Fleischmann was roused by a frantic telephone call. His spinster aunt, Bertha Tausky had been on her way to the Metropolitan Opera House when she suddenly felt ill at Broadway and 26th Street, just steps from the Fleischmann house. Although it was unusual for a well-dressed lady to step into a bootblack establishment, she was too weak to return to the house. The 50-year old woman, suffering a heart attack, entered the shoe shine parlor of D. A. Galvano at No. 11 West 26th Street and asked him to telephone her nephew. Dr. W. S. Smith, who lived just two doors away at No. 7 West 26th Street, was also sent for. By the time William Fleischmann arrived, Bertha was unconscious. Before the doctor could get there, she had died. Although the Chapel managed to plod on for a number of years, by the end of World War I the boys’ club was gone from the 26th Street house and it had been converted for business. Benjamin Melnick’s Majects Mfg. Company made women’s clothing here until 1922. For another two decades it would house clothing makers like Dorfman Bros. Furs, here until its bankruptcy in 1928. Finally in 1942 Trinity Chapel gave up the fight. In 1943 the Serbian Orthodox Church purchased the complex, establishing the Cathedral of Saint Sava. The deal included No. 20 West 26th Street which, in 1956, was converted to two apartments per floor. Today the major exterior alterations are, obviously, the loss of the stoop and doorway and the wonderful stone railings. But otherwise the last vestige of the exclusive residential block survives relatively intact from the days when ladies in sweeping Victorian dresses and waistcoated gentlemen stepped into carriages at the foot of its stoop. i just absolutely love new york brownstones. do you know where i can find floorplans of them? Don't know where you might find floorplans; however typical brownstones like this one typically had two large rooms per flooor: family dining room to the front of the basement, kitchen behind; parlor on the first floor, dining room behind; bedrooms on the upper floors. Stair hall was on either side, depending on the entry placement.